Graffiti is virtually everywhere in Buenos Aires. This is one of the first things you notice about the city. 31 years ago Buenos Aires had no graffiti problem. Of course they also had no democracy, and would have gladly exchanged one for the other. Our guide Anna from Graffitimundo explained how graffiti came to Argentina as one form of free expression after the return of democracy and the end of the dark days of military dictatorship. 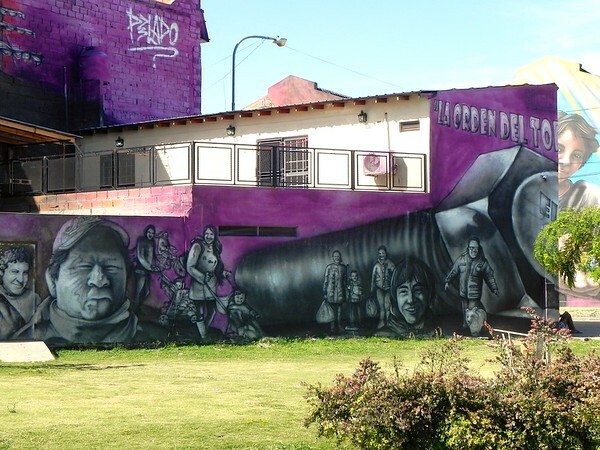 In Buenos Aires it was not started by gangs but by middle class kids who could afford 100 peso spray paint cans and who had traveled to other countries and come into contact with hip hop culture. This was easier to do around the turn of this century when the Argentine peso was trading at parity with the U.S. Dollar. I have been on graffiti tours before but was not expecting some of these differences in the Argentine graffiti and street art scene. Since the 1950s Argentina has commonly had illegal graffiti as messages were painted on community walls and repainted sometimes weekly. It was not gangs but political parties that might paint their message on your wall announcing a candidate or a platform. While this form of graffiti was theoretically illegal, even the party in power would and still do pay to share their messages around town. This made it a sort of double standard when graffiti artists and street artists were breaking the law by putting their messages on the same walls. This is another reason why Argentina has more tolerance for graffiti. Traditionally graffiti starts with signing your name on a public space. This can be as simple as a tag (one color spray paint done quickly) or can be quite complicated multicolor, three dimensional stylized signatures often only readable to other members of the graffiti community. 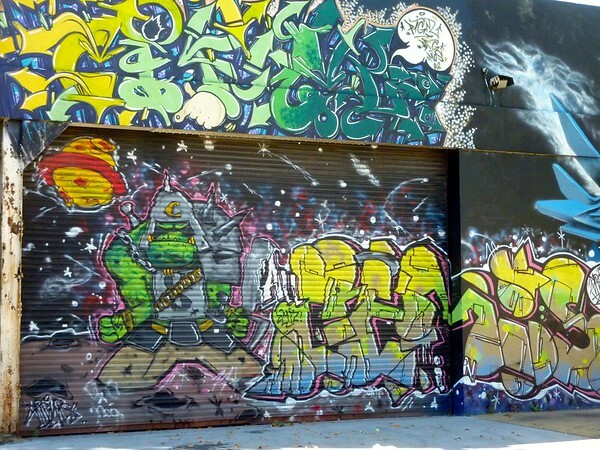 “Graffiti is a message to a closed community”, Anna told us. But as you can imagine, many graffiti “artist” tired of nearly signing their name again and again. Some of these then learned to draw and began creating pieces that would be more universally greeted as art not vandalism. In Buenos Aires some of the artwork is activism. This piece shows soccer thugs as animals as a commentary on the gangs that infest the soccer culture of the area. Although the piece may have not had the desired effect when those depicted were flattered by the work. When two British expats, Marina Charles & Jo Sharff, came to live in Buenos Aires in 2008, they were surprised to see some of these pieces had not only readable signatures but websites and even cell phone numbers. They started contacting these artists to learn their story. They fell in love with this story and started the series of graffiti tours that became GraffitiMundo. Jo has since traveled on while Marina continues to run the company. Her new business partner Jonny Robson has been creating a soon to be release documentary on the Buenos Aires graffiti scene called “White Walls Say Nothing”. GraffitiMundo now also includes a gallery where their sell smaller pieces by artists. While I was very impressed with the street art, the current exhibit at the gallery did not grab me. 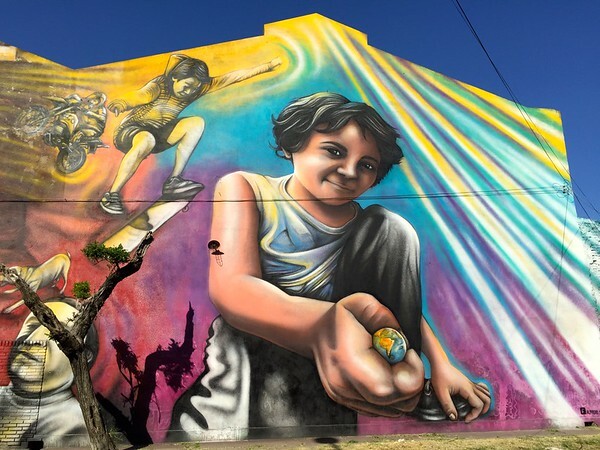 Argentina had muralists well before the graffiti scene visited the city and art for the community on community spaces is drawing artists from all of the world to come to Buenos Aires. With the most recent downturn in the economy even some commercial artists have contributed artwork in public spaces as part of a project to “take back the city”. 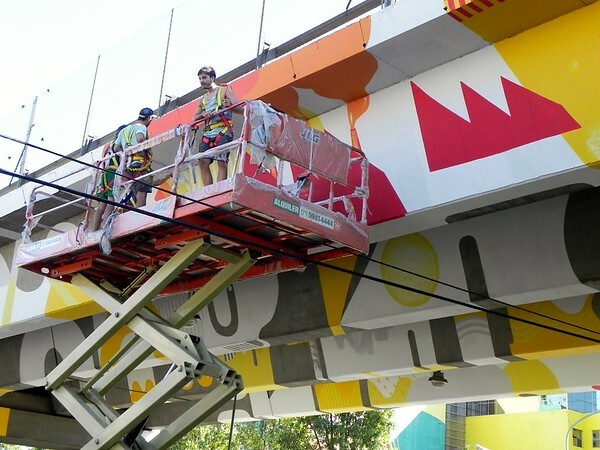 We happened to be driving under one of the city’s underpasses while one artist Pedro Perelman and a crew were decorating it. 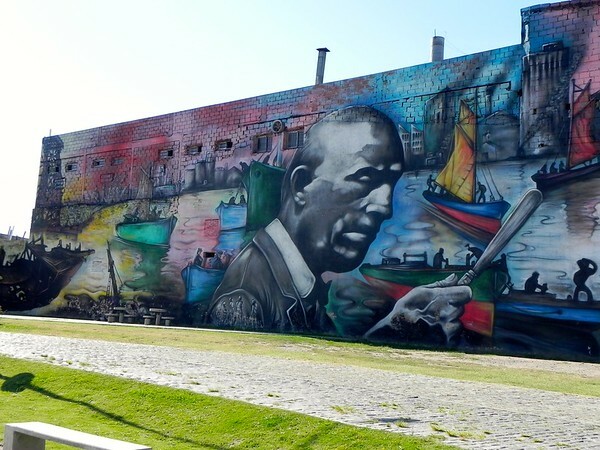 Another very notable piece was the “world’s largest” mural which was dedicated to the art of Benito Martin whose artwork found its roots in La Boca in Buenos Aires. This project spilled over to nearby factories now decorated with the faces of local factory workers or even with passers by. If you have a half day, the GraffitiMundo is a fantastic way to learn more about this ubiquitous form of artwork in Buenos Aires. I highly recommend it and want to thank the Buenos Aires Tourism board for arranging my tour. See my photos from the GrafiffiMundo tour. Cool post! Thanks for sharing the beautiful photographs of the street art. 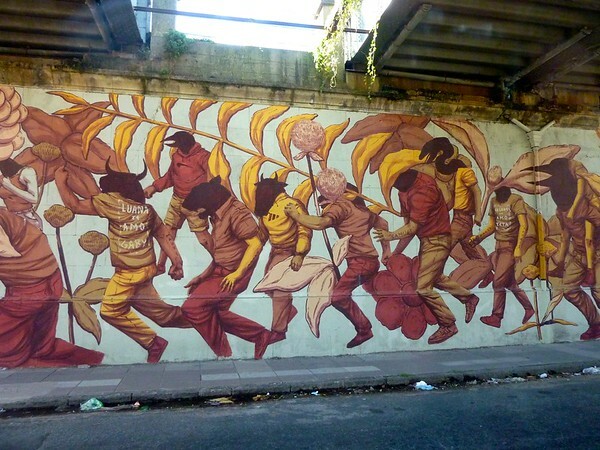 Have you ever seen the murals in Valparaiso in Chile? I think that would be some of the most unique art I have seen in South America.